Eighty percent of the calls the San Francisco Police Department receives are related to mental health, but the police are oftentimes not the best people to respond to those situations. That’s where non-profit startup Concrn comes in. Concrn is a mobile app that enables people to help those experiencing mental health crises by connecting them with compassionate responders. 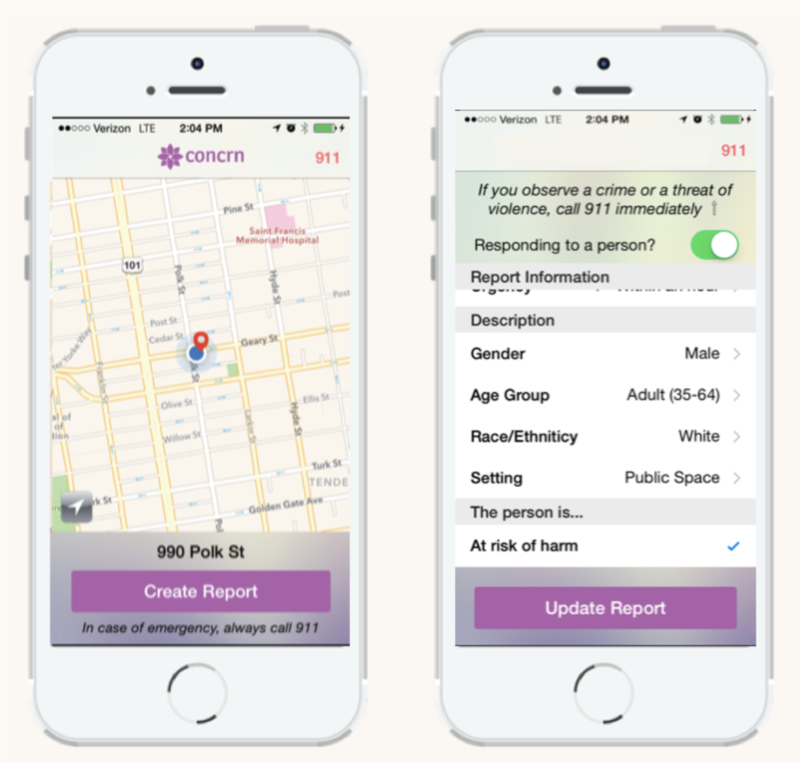 Since launching its app a couple of years ago, Concrn has responded to over 2,000 crisis reports. Concrn currently serves those in San Francisco’s Tenderloin neighborhood. That means if you see someone having a mental health crisis or an issue with substance abuse, and don’t think calling 911 is the appropriate response, you can use Concrn to request a compassionate responder. Concrn has a seven-person lead responder team, but there are other crisis volunteers who donate their time to help on a weekly basis. Many of the paid responders are from the Tenderloin. “Our focus has been to create economic opportunities for people in the Tenderloin community who have previously been marginalized or unable to access employment and also people who have experienced their own mental health crisis in the past,” Concrn Co-executive Director Neil Shah told TechCrunch. Once on scene, the responders will determine if they can handle the situation or if it needs to be escalated to the police. The responders, who have a variety of backgrounds in social work, emergency medical training and other areas, are required to go through a 20-hour training session. The training covers conflict resolution, de-escalation training and compassionate response. “From there, it’s connecting the person to relevant services, like walking someone to a shelter, retrieving information about them from a case manager and ensuring they get reconnected,” Shah said. On a daily basis, Concrn receives anywhere from five to 10 crisis reports. While Concrn’s approach has mainly been focused on the Tenderloin, the team has been coordinating with other mobile crisis units, city agencies and service providers in San Francisco in order to deploy the most compassionate service providers to other areas throughout the city. “Our goal is to work with the cities and with other service providers and use our tech as a lynchpin and communication network between all these siloed organizations,” Shah said. Looking forward, Concrn is hoping to raise $250,000 to continue developing the service and launch an app for responders. Right now, a dispatcher handles the inbound report, but the app would allow responders to connect directly with the reporter. Concrn also hopes to create a replicable playbook to distribute to other communities that experience similar issues.